The anniversary was a well-attended event by both national and international parties, including visits by the German and French Ambassadors to the Community. 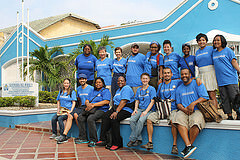 The Ambassadors walked around San Josecito, also called La Holandita, the Community’s main hamlet, and had a community-guided tour to the center of San José, which including seeing the cemetery, the police base, the army base, and the new “mega high school” at the foot of the army base, as well as other sites historically significant for the Peace Community.This was an important tour to take, considering that the Community displaced from San José in 2005 after the construction of the bases. During a ceremony, candles were lit for the numerous community members, who had been killed during the nonviolent resistance of the San José Peace Community, and on the evening of the 23rd the celebrations were closed with a dance in the kiosk of La Holandita. Celebrations coincided with the Universidad Campesina (Campesino University), also called the “University of Resistance”, in which communities from across the country share their knowledge in workshops and seminars. Overall we were very inspired by the series of events celebrating the strength and resistance of the San José Peace Community. Out of Bogotá, Kaya and Gale went to Buenaventura and were in the Humanitarian Space of Puente Nayero for International Women’s Day on March 8th. There the community celebrated with various games and events, but also created a memorial event in honor of Marisol, a woman beloved in the community and killed in the “chop house” on the street before Puente Nayero became the Humanitarian Space almost a year ago. 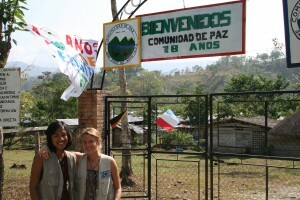 Later in the month, the team headed to a municipality outside of Bogotá called Nilo. In Nilo, a community that has lived there for decades lives with tension and pressure since the construction of the significant Tolemaida Military Base immediately alongside the community in 1954. Kaya and Gale were there for three days for events called by the Evaluation, Followup, and Attention Committee in order to have a meeting with the community, talk about the necessary measures to improve housing in disrepair, discuss possible relocation for some of the families living there, and do a verification commission. 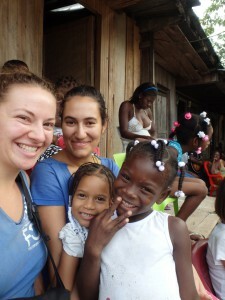 They were three very full days, including an assembly with the community and the new General and Commander of Tolemaida. In Bogotá, FOR Peace Presence also helped organize a roundtable discussion and webinar around the question “Coal mining in Colombia, what has it left us in 30 years?” There was a great turnout, with over 165 people attending in person and via internet. The event included live tweeting in English, Spanish, and German to spread to a wider audience. We also hosted a wonderful delegation of professors and students from the Pacific School of Religion, from Berkeley, California. In a whirlwind ten days, our delegates met with over ten organizations or individuals, including our partners at Tierra Digna, CONPAZ (Constructing Peace in Communities), the Interchurch Justice and Peace Commission, and ACOOC, among others, here in Bogotá. They then traveled to the Caribbean Coast with Candice and Michaela, and met with Caribe Afirmativo, an LGBTI advocacy organization, and visited the community of Tamarindo outside of Barranquilla. This turned out to be a particularly important connection, because towards the end of March/beginning of April, the community became threatened by forced eviction (take action here). Afterwards, they visited the community of Boquerón in the mining region of the country before returning to the capital to meet with a representative of the U.S. Embassy, bringing concerns and specific requests about those they had met on the delegation. In numbers, our Urabá team accompanied for 31 days, including 4 official meetings. The Bogotá team accompanied in the departments of Valle del Cauca and Cundinamarca for a total of 8 days and co-hosted 1 roundtable discussion on mining. We welcomed a delegation, which met over 10 Colombian communities, organizations, or individuals, and our Coordination and Direction went with them to the departments of Atlántico and Cesar. Upon return to the capital, we had 1 US Embassy meeting, and published 3 Flickr albums and 3 written pieces to our website. Thank you as always for your attention and care in reading and keeping updated on the work of our partners and of us; your focus, sharing with those you live and work with, and donations help support us and keep protecting human rights defenders in Colombia, and we could not be more appreciative. We couldn’t do it without you.